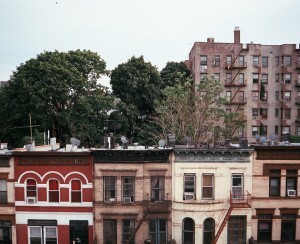 I lived in Jackson Heights, Queens, for a year and a half. 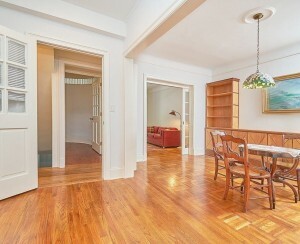 I rented a huge one-bedroom that was over 1,000-square-feet. It was a dream apartment really. And it was only $1,500 a month. What attracted me to Jackson Heights was the fact that you could get so much bang for your buck. I also loved the landmarked historic district with its exceptional archictecture and genteel atmosphere. It’s really one of the best kept secrets in the city. Jackson Heights is also an extraordinary place to put your finger on the pulse of what New York is now. The diversity of cultures is breathtaking and energizing. The sheer diversity shows itself in the range of restaurants …tons of authentic Colombian, Indian, even Nepalese places. You name it, it was there. You could become well schooled in world cuisine just by walking down a strip on 37th Avenue. I think there are few neighborhoods in the city with that much diversity of culture. In that respect it was truly incredible. But there were problems, too. One was the walk to the subway (about 8-10 minutes). I would have preferred to be closer to the train. On the positive side, the 74th Street and Roosevelt train station has the E, F, R and 7, which meant the commute was fast. The main problem, though, was a social one. My friends didn’t really know what or where Jackson Heights was, and getting people to make the trek out to visit my beautiful, large apartment was difficult. That was very frustrating for me. And a good number of my friends were living in Brooklyn, along the Brownstone Belt. The more I got to know those neighborhoods, the more I liked them. 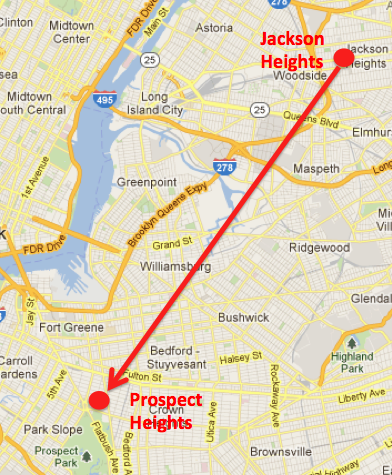 Eventually I decided to find a place to buy in Prospect Heights. I couldn’t find anything that met all of my requirements at the right price (one-bedroom for under $400,000), so I chose to rent there instead. I specifically liked Prospect Heights’ mix of shops and restaurants, and proximity to Prospect Park (Jackson Heights doesn’t have anything like that), the Brooklyn Museum and the library. When you live in Prospect Heights you’re also close to other great Brooklyn neighborhoods like Fort Greene and Park Slope. But Prospect Heights -- particularly along Vanderbilt Avenue -- has really come into its own. I liked to have pizza at Franny’s on Flatbush Avenue, ice cream at Ample Hills Creamery on Vanderbilt and at Blue Marble on Underhill Avenue. The housing stock is also so beautiful. Something I didn’t see in Queens that exists in copious amounts in Brooklyn are those classic Brooklyn brownstones. I like living in neighborhoods like that. And when I moved in two years ago, Prospect Heights was a sort of sweet spot -- it had those distinctive Brooklyn properties but wasn’t as expensive as Park Slope or Brooklyn Heights. That’s changed in the last two years since I’ve been there. It’s just not an incredible deal anymore. I’m actually looking to move again -- my apartment just wasn’t right. It was $1,800 a month and much smaller than my place in Jackson Heights. But on Eastern Parkway, near the museum and library, it’s about as dream a Brooklyn location as you can get. 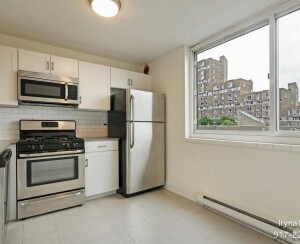 In Jackson Heights the apartment was amazing and I wasn’t thrilled about the neighborhood. In Prospect Heights it was the other way around. In hindsight, despite my fervent desire to move to Brooklyn, I should have stuck it out longer in Jackson Heights. It would have been more fiscally prudent. I could have waited to find a better place, or even bought, in Prospect Heights, which would have been a good investment. Places just two years ago were selling for somewhere in my price range -- the high $300k's-; now those same places are in the $500k's.